Jellied eels are a traditional English dish that originated in the 18th century, primarily in the East End of London. The dish consists of chopped eels boiled in a spiced stock that is allowed to cool and set, forming a jelly. It is eaten cold. The eel was a cheap, nutritious and readily available food source for the people of London; European eels were once so common in the Thames that nets were set as far upriver as London itself, and eels became a staple for London's poor. 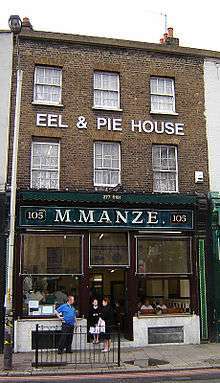 The earliest known eel, pie and mash houses opened in London in the 18th century, and the oldest surviving shop, M Manze, has been open since 1902. At the end of the Second World War there were around a hundred eel, pie and mash houses in London; in 1995 there were eighty seven. The water quality of the Thames has improved since the 1960s and is now suitable for recolonisation by eels. The Environment Agency supports a Thames fishery, allowing nets as far upriver as Tower Bridge. The dish is traditionally prepared using the freshwater eels native to Britain. Typically, the eels are chopped (shucked) into rounds and boiled in water and vinegar, to make a fish stock, with nutmeg and lemon juice before being allowed to cool. The eel is a naturally gelatinous fish so the cooking process releases proteins, like collagen, into the liquid which solidify on cooling to form a jelly, though gelatin may be added in order to aid this process. Recipes for jellied eels are individual to particular London pie and mash shops, and also street sellers; however, traditional recipes for authentic Victorian jellied eels all have common ingredients and cooking methods. What alters is the choice of herbs and spices used to flavour the dish. Jellied eels are often sold with pie and mash—another traditional East End food—and eaten with chilli vinegar or with malt vinegar and white pepper. In Denmark the dish is known as ål i gele, in France as aspic d'anguille, in Germany as Aal in Aspik, and in Poland as węgorz w galarecie; all terms mean jellied eel. In the popular sitcom Only Fools and Horses, jellied eels is often referred to as Alan Parry (father of Cassandra)'s favourite food. In 2012 game Dishonored, a product called "Pratchett Jellied Eels" appears as a food staple in the game's 19th centuresque fictional universe. The character Owen Harper on the BBC show Torchwood pretends to be a jellied eel magnate while undercover in the series 1 episode "Combat". Jack Johnson, an early 20th century black boxing heavyweight champion, notoriously defied taboos by consorting with white women, among other behaviours. "Asked the secret of his staying power by a reporter who had watched a succession of women parade into, and out of, the champion's hotel room, Johnson supposedly said, 'Eat jellied eels and think distant thoughts'"
In Neil Gaiman's novel Stardust, the character Quintus died after eating jellied eels that had been poisoned by his youngest brother Septimus. In The Mighty Boosh the mysterious cockney Hitcher discusses and sings a song about eels, presumably jellied eels as he refers to eating them for free at an East London pie and mash shop. In P.G. Wodehouse's Jeeves and Wooster novels (set in the early 20th century), the narrator sometimes refers to "jellied eel sellers" in a manner which implies the typical jellied eel seller is a disreputable fellow, but without further explanation. ↑ Donald Strachan (8 Aug 2012). Frommer's London 2013. John Wiley & Sons. p. 244. ↑ Copping, Jasper (2007-06-18). "Eels in danger of slipping off the menu". The Telegraph. Telegraph Media Group Ltd. Retrieved 2008-12-11. ↑ Richard Schweid (2010). Consider the Eel. Univ of North Carolina Press. p. 94. ↑ Naismith, I. A.; B. Knights (2005-04-04). "The distribution, density and growth of the European eel, Anguilla anguilla, in the freshwater catchment of the River Thames". Journal of Fish Biology. 42 (2): 217–226. doi:10.1111/j.1095-8649.1993.tb00323.x. Retrieved 2008-12-11. 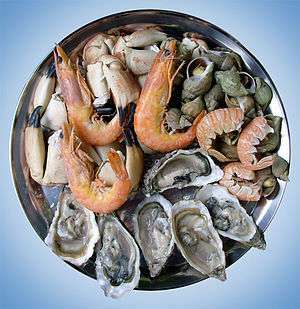 ↑ "Commercial Fisheries in the Thames Estuary". ThamesWEB. ThamesWEB.com. Archived from the original on 2006-11-27. Retrieved 2008-12-11. Would you Adam and Eve it? Jellied eels hit by over-fishing London Evening Standard, 3 January 2012. Wikimedia Commons has media related to Jellied eels. http://www.pie-and-mash.com Website dedicated to an appreciation of Pie, Mash and Eels. http://www.barneys-seafood.co.uk The website of Barneys Seafood with links to their eels and stories about Eastend food culture and social history.